A few months ago I wrote up an article on using PyTools, Visual Studio, and Python all together. I received some much appreciated positive feedback for it, but really for me it was about exploring. I had dabbled with Python a few years back and hadn’t really touched it much since. I spend the bulk of my programming time in Visual Studio, so it was a great opportunity to try and bridge that gap. I had an individual contact me via the Dev Leader Facebook group that had come across my original article. However, he wanted a little bit more out of it. Since I had my initial exploring out of the way, I figured it was probably worth trying to come up with a semi-useful example. I could get two birds with one stone here–Help out at least one person, and get another blog post written up! The request was really around taking the output from a Python script and being able to display it in a WinForm application. I took it one step further and created an application that either lets you choose a Python script from your file system or let you type in a basic script directly on the form. There isn’t any fancy editor tools on the form, but someone could easily take this application and extend it into a little Python editor if they wanted to. Open an existing project or start a new one. Switch to the “Application” tab. Under “Target framework”, select “.NET Framework 4.0”. Right click on the project within your solution explorer and select “Manage NuGet Packages…”. In the “Search Online” text field on the top right, search for “IronPython”. Select “IronPython” from within the search results and press the “Install” button. Follow the instructions, and you should be good to go! 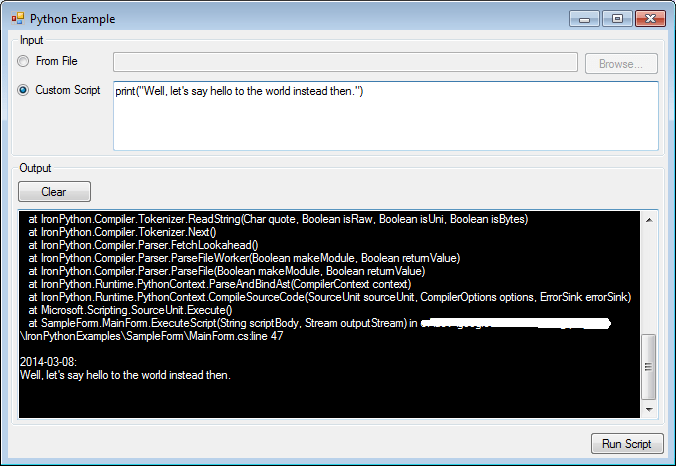 Now, any time you output to the console in IronPython you’ll get your console output directly in your TextBox! The ScriptOutputStream implementation and calling SetOutput() are really the key points in getting output from IronPython. I wanted to take this example a little bit further than the initial request. I didn’t just want to show that I could take the IronPython output and put it in a form control, I wanted to demonstrate being able to pick the Python code to run too! Enter a path or browse for your script. Press “Run Script” to see the output of your script in the bottom TextBox. Next, press “Run Script”, and you’re off! This simply uses a StreamReader to get the contents of the file and then once in the contents are stored in a string, they are passed into the IronPython engine’s Execute() method. 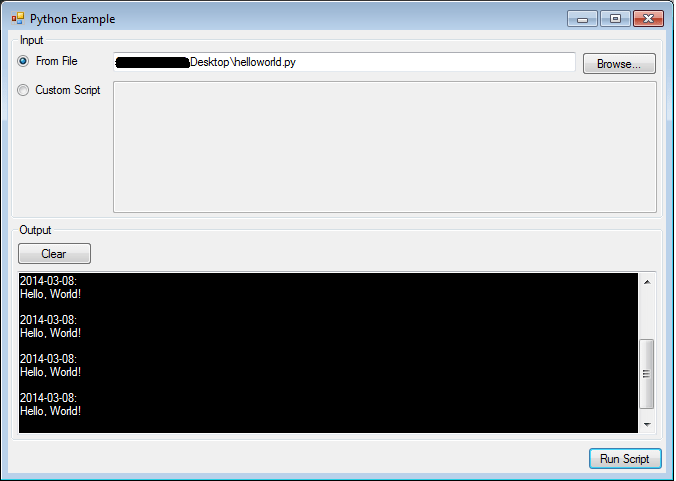 As you might have guessed, my “helloworld.py” script just contains a single line that prints out “Hello, World!”. Nothing too fancy in there! Python interpreted the input we provided but, as expected, could not find a definition for “asd”. Python interpreted the script, but found a syntax error in our silly input. Python interpreted our simple Hello World script. This sample was pretty short but that just demonstrates how easy it is! Passing in a script from C# into the IronPython is straight forward, but getting the output from IronPython is a bit trickier. If you’re not familiar with the different parts of the IronPython engine, it can be difficult to find the things you need to get this working. 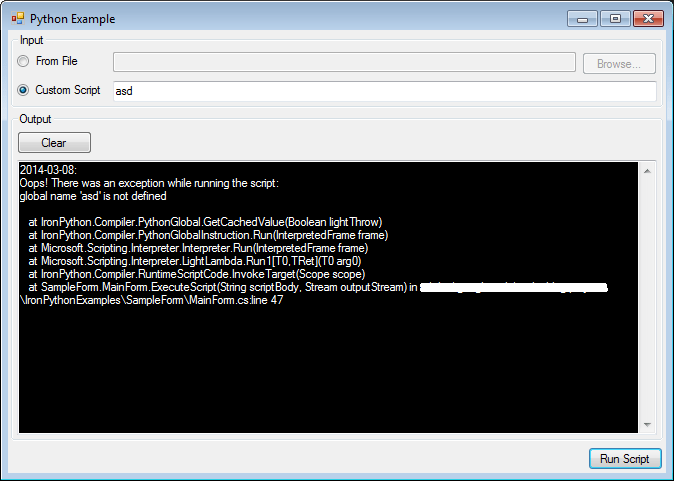 With a simple custom stream implementation we’re able to get the output from IronPython easily. All we had to do was create our own stream implementation and pass it into the SetOutput() method that’s available via the IronPython engine class. Now we can easily hook the output of our Python scripts! Creating your own Python IDE. Figure out some nice text-editing features and you can run Python scripts right from your application. Creating a test script dashboard. 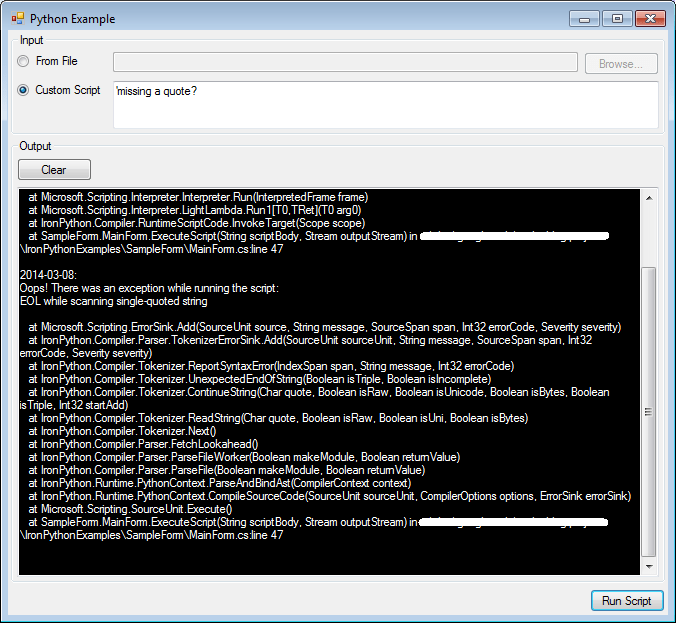 Do you write test scripts for other applications in Python? Why not have a dashboard that can report on the results of these scripts? Add in some game scripting! Sure, you could have done this with IronPython alone, but maybe now you can skip the WinForms part of this and just make your own stream wrapper for getting script output. Cook up some simple scripts in a scripting engine and voila! You can easily pass information into Python and get the results back out. Let me know in the comments if you come up with some other cool ideas for how you can leverage this!